1. Pork belly is cheap. I found three bellies for $3, enough for dinner for two. 2. You don’t have to cook it for days in order to get tender, flavorful results. Sure, you could brine it, braise it, slow cook it, and eat it 36 hours later. But this recipe proves that you don’t need to. It takes less than an hour from start to finish. 3. In Vietnam, this caramel pork belly is called Thit Kho and it’s usually served with a soft boiled egg. You could take the traditional route, or you could stack these delectable treats on a crusty French baguette a la Bahn Mi. 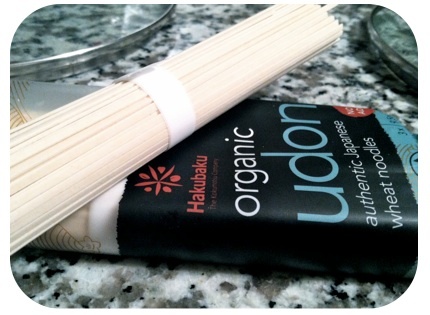 But for this easy dinner, the flavored udon noodles were just perfect. In a large saucepan, heat 2 tbs of vegetable oil and saute the chopped onion and garlic. While that’s getting soft, slice the pork belly into one inch bites (I half-froze the pork belly, which made this much easier). When the onions and garlic are happy, throw in the pork belly. Let it brown on each side over medium-high heat (should be about 10 minutes). While the pork belly is browning, add the water and sugar to a small sauce pan. Keep an eye on your caramel and stir it with a wooden spoon regularly over medium low heat. When the sugar melts and the mixture turns from sugar-water to caramel, you want to be there for it. Once your pork belly is browned, add the fish sauce and then the caramel sauce. 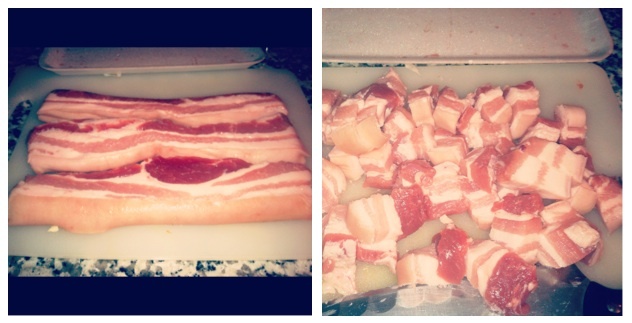 You’ll notice that the pork belly is already starting to look more like scrumptious pork and less like fatty belly. Let the whole thing simmer for another 30 minutes. Onto the noodles! These are super easy and you can use whatever type of noodles you prefer. I’m not a huge fan of vermacilli, so i try to choose a thick wheat or egg noodle when I’m shopping. Cook the noodles per instructions on the box, then toss them with the sesame oil, sesame seeds and grated ginger. 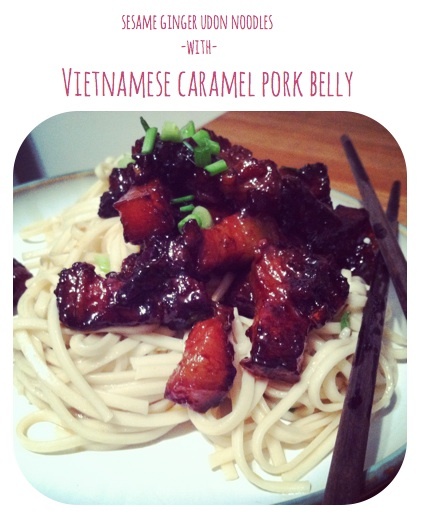 Serve the pork belly over the noodles, top with scallions, and enjoy!